There is lot of countertop materials available in the market. Based on the price, durability and versatility one can choose the correct countertop materials for their home. There are some materials that may require extra care, where you have to maintain properly to increase their lifetime. Sometimes heavy materials are used in kitchen, which damages the countertops in the kitchen. This is not only unsatisfactory but also diminishes the look of your countertops. So you no need to spend more money for repairing, the countertop repair kit solves your entire problem in some cases. Where it does not, feel free to contact United Granite NJ that they can give you a professional perspective as to what can be done with your kitchen countertops. Granite is one of the strongest material is this world. If there is any damage to Granite Countertops you may not contact a professional to handle your repair. The granite repair kit can quickly fill the repaired area, which makes your countertop to normal state. The kit is easy to use and one of the easiest way to fix your countertop problems. The gel epoxy that comes with the kit is applied in the damaged area and spray the hardener on the area. Then wipe down and make the area dry, take a razor blade to make it smooth to make it level with the rest of your granite countertop. Applying some granite polishers will make the area shining. This kit works excellently with Marble Countertops. 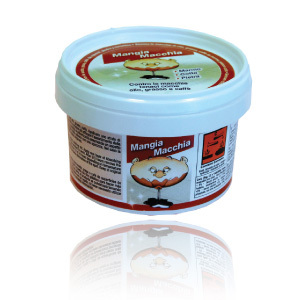 Marble is slightly softer in nature so these kits allow repairing the damaged area easily. Repairing minor problems in laminate countertop is easier; you can fix small chips with laminate repair paste to match the color of countertop. Bigger problem will require replacing the damaged place. There are different colors of laminate countertops available in the market, but finding an exact match for an old countertop will be difficult. 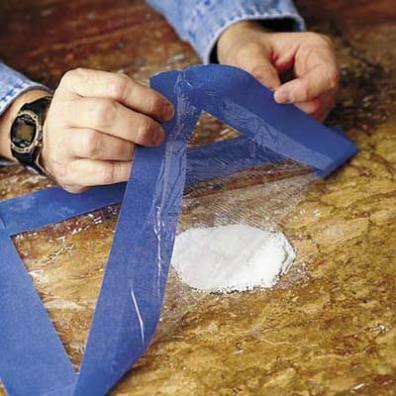 If there is any damaged to tiles or any cracks, you can apply epoxy glue into cracks with toothpick, then color with matching paint. This countertop becomes scratched or become dull over time. The scratches cannot be removed permanently; you can polish them into warm finish by vegetable oil. Stains can be removed with a paste of baking soda and dish soap. The above mentioned are the ideas on how to repair a countertop. Minor problems can be easily repaired by you, whereas the major problem can be repaired by professionals in this field. Most of the countertop problems can be recovered by having marble and granite repairing kit. Using these methods will make your countertop more effective. Surface Link is another repair source for natural stone. It is a complicated area as to how to decide on the overhangs on your new granite countertops and how you can decide when to have supports. Granite fabricators often say you are safe up to 12″ overhang, or 10″ overhang without any support bracket, but is it really possible to standardized the issue with measurements, or is there more to it than just how much overhang you have overall? It is not as easy as it sounds to decide when to have support brackets or plates on your new granite countertops. There is too main differences looking at the topic. Deciding on on the support on a knee wall top (bar top or raised top) is much different than deciding on kitchen island top or peninsula top. The other overhang usage is on the kitchen island or peninsula. if you do not have a cut out close to the overhang, and if the granite is durable enough, you can go as much as 12″ overhang without any support material. Some stones are more fragile. Using support brackets for those stones, especially more exotic ones, is recommended. A professional granite fabricators such as United Granite will be able to make more precise recommendations on the overhangs pertaining your project. See them if you are looking for granite or marble countertops in MD. Washington DC is a very wealth and congested area. A lot of government workers and contractors are located either in Northern Virginia, or Maryland, DC area. There are lot of contracting firms providing work to the government as well. All this brings robust economy in Maryland and Virginia. The houses being pretty old in older cities such as Arlington or Alexandria VA, makes it a obligation for either demolishing the entire house and building a new one, or at least remodeling it. Either you remodel your house or build a new one, there are certain things you need for sure. Kitchen and Bathroom Cabinets, kitchen and bathroom countertops, back splashes are just a few to name. When all these factors are summed , it will be much easier to grasp why there are a lot of granite, marble and quartz fabricators in MD, VA and entire washington DC area. http://www.granitecountertops.pro is one of those granite fabricators in MD and VA servicing Washington DC area. They offer kitchen countertops, bathroom vanity tops, granite counutertops, marble countertops, soapstone and quartz countertops, and more. Their locations include Elkridge MD, Crofton MD, Chantilly VA, Fairfax VA, and Sterling VA They carry actual granite, marble, soapstone and other natural slabs in their stock. They are certified installers and manufacturers of Cambria, Silestone, Caesarstone, Zodiaq and other quartz countertops for kitchen or bath. You will be amazed with uniqueness of the natural stones they carry in their stock. Being able to access that many granite fabricators brought a lot of questions onto the table. If they all carry same or similar stones, with same or similar pricing, how to decide on which granite fabrication shop to go with. It sometimes is overwhelming to go thru this process because of time and budget limitations. There is not an easy answer to the question as to how to choose your granite fabricator in MD or VA. The best answer is probably that there are more than 1 appropriate granite fabricators in the are doing a good job at a good price. Of course, going with the least expensive granite shop does not make sense as the price comes with the service and installation. Going with the most expensive one does not make sense either because you do not want to pay for high advertisement costs, or luxurious showroom of a granite fabricator. Always do not forget that buying kitchen countertops is a process. It takes time and effort. We always recommend choosing your slabs before job going into fabrication. Thinking of small details make difference as well. Carefully consider how much overhang to have, what kind of back splashes to use. Also read this blog if you are looking for granite countertops in Upper Marlboro MD area. United Granite Crofton MD slab showroom serves Annapolis MD area. United Granite displays actual granite, marble soapstone, onyx, quartzie slabs at the Crofton MD location. It is located in the Crofton shopping center next to gold gym. Visit http://unitedgranitemd.com/ if you are in the marker for new counters in Annapolis MD area. Visit here if you are looking for granite kitchen countertops in Timonium Maryland. Stain removal takes time and patience. Before doing any work, it is important to determine what stained the stone. This article will give general information on stain removal, a method that works for most of the stains. The idea of the stain removal is to such the stain out of the stone using chemicals. The chemicals usually dry up so quickly that a powder is used – usually talcum powder, baking soda, or baby powder. Easier method to remove stains is to use a stain remover poultice. These poultices are specifically designed to remove stains from natural stone without damaging the stone. There are a few different brands in the market. They all work, but I personally will recommend Bellinzoni Mangia Stain remover . You can purchase this stain remover from Regent Stone products. How to apply is pretty easy. Before doing anything, clean the area well. 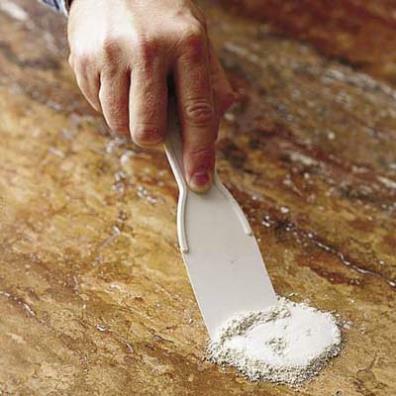 Try to clean as much of the stain as possible before placing stain remover poultice on the stone. You can use water to clean it, or using denatured alcohol or lacquer thinner would even be better. 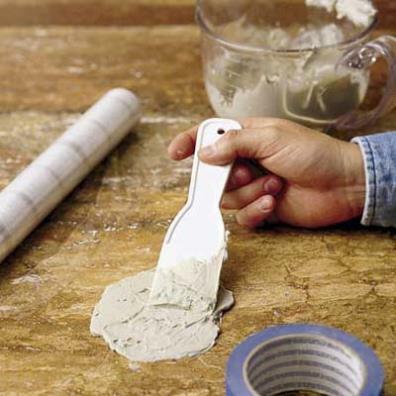 apply the poultice on the stone about 1/4″ thick. repeat the process again if the stain is not completely out. Visit one of our location in Virginia and Maryland if you are looking to buy natural stone, or quartz countertops. United Granite Meausures fabricated and install high quality kitchen countertops, bathroom vanity tops, fireplace surrounds, tub surrounds, shower walls in Maryland. United Granite carries hundreds of natural stones in stock. Natural stone inventory includes granite, marble, soapstone, travertine, quartzite, onyx, basalt, limestone and more. United Granite also fabricates quartz countertops in MD. Quartz products include Cambria quartz, Silestone, Ceasarstone, Zodiaq, Hanstone. Visit United Granite in Elkridge MD if you are looking for countertops in MD. The countertop color should contrast the cabinet color and the back splash color. There is no issues of the color being similar to flooring color as they do not meet. Color not only should contrast but also combine without being too similar to cabinet color. It should have color tones of the cabinet in it. Smaller kitchens tend to look darker. To avoid that effect, it is best to use light color countertops in smaller kitchens. Darker color stones usually look nicer in bigger kitchens, and light color cabinets such as oak or white. What is most important in choosing the stone color is how you like things. The stone color may be perfect with everything else, however, it may not be what you like. Visit our web site to see the granite, and marble colors we offer. Visit our Elkridge MD location to choose your granite countertops today. Can the nicks on granite be fixed? Granite Countertops can get chipped. It is more likely that these chips are in the high traffic areas such as your cooktop, sink. What can chip granite countertops? This could be any hard object. Since you probably will not have a hammer in the kitchen going around, it is probably a pot, or pan chipping your granite. Using one of the rounded edge options such as pencil or half bullnose may reduce the risk of these potential chips. There is not much else can be done to prevent the chips from developing if you do not like the look of rounded edges. It is fairly easy to fix the chips yourself. There are a few different methods you can used to do the job. We will talk about one of these methods using furniture burn-in sticks. Following picture shows what they look like. 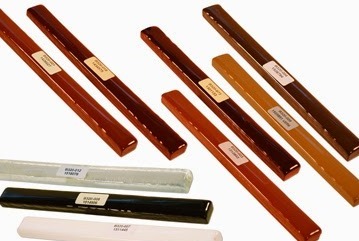 You can buy these sticks from most of the granite fabrication tool suppliers. You will find many of them if you do a little google search using the keywords; chip repair, furniture burn-in sticks. You need to buy the stick closer to your granite color. Also do not buy much as one of these will be enough to repair many chips. Ok, now we know what to fix it with, now lets talk about how to do it. There are a few simple steps we need to take. Step One: Clean the area. Step 3: Even out the area using a razor blade, or another hard object. I hope this article helps you repair your own granite yourself. Please leave comments about your experience. You can find us in Elkridge Maryland if you need any countertops.